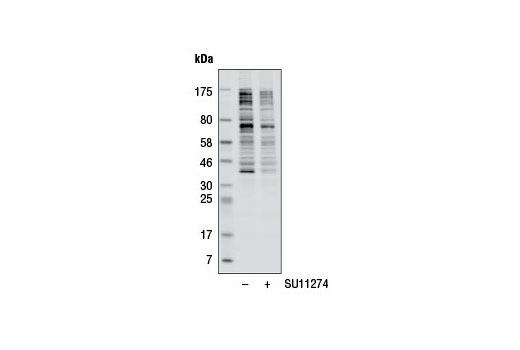 Western blot analysis of extracts from MKN-45 cells, untreated or treated with c-Met kinase inhibitor SU11274 (1 µM, 2 hr), using Phospho-Akt Substrate (RXRXXS*/T*) (23C8D2) Rabbit mAb. Western blot image was obtained using the Odyssey® Infrared Imaging System (LI-COR® Biotechnology). Western blot analysis of extracts from A-431 cells, untreated or treated with Human Epidermal Growth Factor (hEGF) #8916 (10 ng/ml, 20 min), using Phospho-Akt Substrate (RXRXXS*/T*) (23C8D2) Rabbit mAb (upper), or Phospho-Akt (Ser473) (D9E) XP® Rabbit mAb #4060 (lower). Western blot images were obtained using the Odyssey® Infrared Imaging System (LI-COR® Biotechnology). 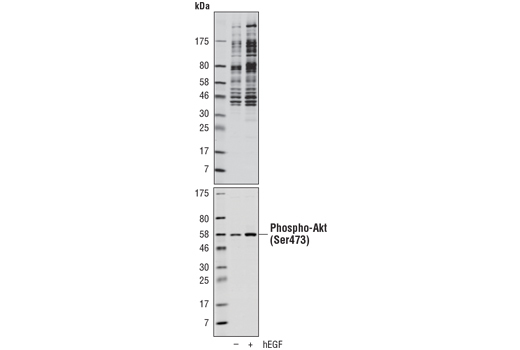 Phospho-Akt Substrate (RXRXXS*/T*) (23C8D2) Rabbit mAb recognizes endogenous proteins containing phospho-Ser/Thr preceded by Arg at positions -5 and -3 in a manner largely independent of the surrounding amino acid sequence. Minor cross-reactivity is observed for proteins that contain phospho-Ser/Thr preceded by Arg at position -3 only. No cross-reactivity is observed with the corresponding nonphosphorylated sequences or with other phospho-Ser/Thr-containing motifs. Monoclonal antibody is produced by immunizing animals with an Akt substrate peptide library. An important class of kinases, referred to as Arg-directed kinases or AGC-family kinases, includes cAMP-dependent protein kinase (PKA), cGMP-dependent protein kinase (PKG), protein kinase C, Akt, and RSK. These kinases share a substrate specificity characterized by Arg at position -3 relative to the phosphorylated Ser or Thr (1,2). Akt plays a central role in mediating critical cellular responses including cell growth and survival, angiogenesis, and transcriptional regulation (3-5). While a number of Akt substrates are known (such as GSK-3, Bad, and caspase-9) many important substrates await discovery. Akt phosphorylates substrates only at Ser/Thr in a conserved motif characterized by Arg at positions -5 and -3 (6). Phospho-Akt substrate-specific antibodies from Cell Signaling Technology are powerful tools for investigating the regulation of phosphorylation by Akt and other Arg-directed kinases, as well as for high throughput kinase drug discovery. Montminy, M. (1997) Annu Rev Biochem 66, 807-22. Pearson, R.B. and Kemp, B.E. (1991) Methods Enzymol 200, 62-81. Marte, B.M. and Downward, J. (1997) Trends Biochem Sci 22, 355-8. Jiang, B.H. et al. (2000) Proc Natl Acad Sci USA 97, 1749-53. Scheid, M.P. and Woodgett, J.R. (2000) Curr Biol 10, R191-4. Alessi, D.R. et al. (1996) FEBS Lett 399, 333-8. LI-COR is a registered trademark of LI-COR, Inc.
Odyssey is a registered trademark of LI-COR, Inc.